My rating is 5+ stars out of 5. 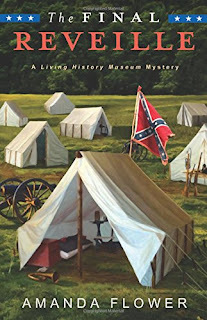 The Civil War is a time in our history that has been the setting of many tales shared though various mediums. Amanda Flower weaves a mystery during a weekend filled with various activities from this time period along with those who reenact the battles. During the weekend of this event on Barton Farms, a murder or two has been committed. Now, the living history is in danger of possibly losing its benefactor and the director has become a suspect and a victim! Plus, the director is a single mom with a 5-year-old son who unexpectedly meets her ex’s fiancée. The chief of police is an intriguing character to me and at times I even thought he was a part of the problem and not doing his job. Living history museums really aid the visitor in the feel of living in the timeframe and not in the present. My husband and sons take great pleasure and have fun being in a group that is globally known as the S.C.A. with each one having a persona from an historical time period. People can appreciate how many articles we take for granted that were made or used during the Civil War or before. Amanda Flower did a superb job of drawing me into the activity and characters of her book, and I believe many would enjoy reading and sharing a copy with friends. The sequel is due in 2016 so be ready for more action, adventure and a mystery or romance to boot! Check out Amanda Flower’s other well written mysteries that know no bounds and keep you entertained all the way till the very last page. Look for her books and then curl up for a few hours of fun that you’ll never regret it!